On the morning of Aug. 6, the Pinellas County Sheriff’s Department released to the city that six African teenagers were involved in a fatal car crash in Palm Harbor. As a result, three of the young men were killed; one placed in critical condition and two arrested. When I heard this, I couldn’t help but find a bit of myself dying as well, knowing that three lives were taken from this community that morning. Unfortunately, that feeling got a lot worse when I found out that these boys were illegally chased by an aggressive and trained cop squad forcing them to crash into a billboard pole, spiraling through the air and ending their short lives. My sadness and mourning turned to fury when I found out that the Pinellas County Sheriff’s Department had something to do with the car crashing and these boys dying. As you may wonder, this same sheriff’s department has been responsible for the deaths of multiple African teens. The most recent being last year’s murder of the three drowned black girls: Dominique Battle, La’Niyah Miller and Ashaunti Butler. The level of slander and disrespect to the families of these three girls was dismantled by the Three Drowned Black Girls committee (lead by District 6 candidate Eritha “Akile” Cainion). My own sister passed out multiple flyers at our school, Gibbs High, for an event led by the community in honor of these girls. She targeted places where she found other event flyers so she wouldn’t be persecuted for doing something she wasn’t supposed to be doing. In response to bringing awareness to the school about what happened (since all they had to look at was the mainstreamed media slandering their peers) my sister found out that the Gibbs High School administrators themselves were taking these flyers down, preventing my sister from spreading the word about that tragedy. Even when the news of the murders was released, Principal Hepburn wouldn’t allow us mourning, confused and depressed youngsters a moment of silence for these girls. A moment of silence! So I now ask where is the outcry from the teachers and the administration when their very own students are dying off at the hands of those who are supposed heroes. The outcry, unfortunately, does not exist. Gibbs High School and the entire Pinellas County School District has shown direct disdain towards the black students, whether it is for our hairstyles, the way we wear our clothes or the way we walk or talk. They have taken a stance of unity with corporate media and have prioritized the slander of African youth over allowing our voices to be heard. We now have to be in a certain intelligentsia type program to be viewed as a “good black student,” and this involves dressing a certain way, talking a certain way and acting a certain way that we may not feel comes naturally. Within these acts, the school has now united with the slander, has united with the state and has united with the idea that the African youth of south St. Petersburg are criminals and delinquents that deserve to die. They’ve united with the use of police terror with their infamous use of resource officers on campus who even have their own history of brutality and violent agitation on the bodies of black students. As you see, this is the colonial reality for African youth in its true form. What happened the morning of Aug. 6 and what came about from it is supported and endorsed by the school systems, the judicial systems and the entire body of the state. Its job is to further enforce the bourgeois line of the white ruling class. A way of moving forward and the only way to prevent something like this from happening is black community control of the police. This is a way for this community to hire, fire and discipline whoever is sworn to protect this community. Currently, we do not have the power over who polices our community, and this has resulted in multiple murders and parents having to bury their children. 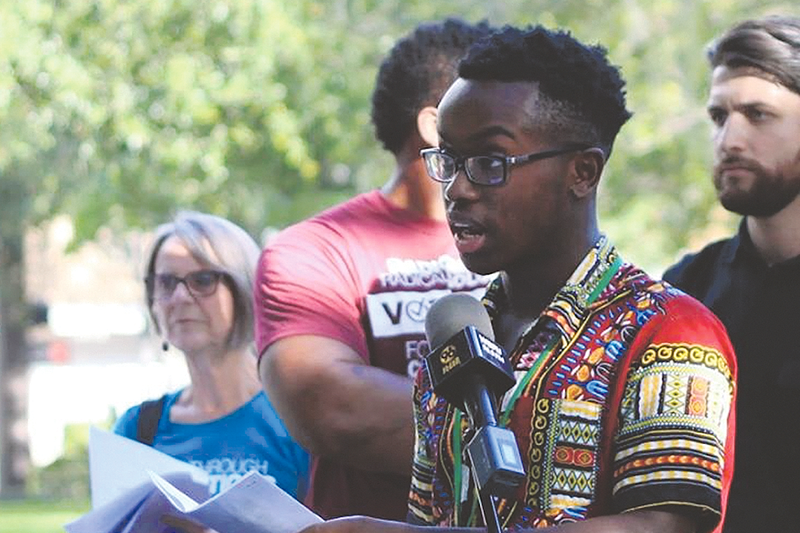 You can find the demand for black community control of the police on both Jesse Nevel (candidate for mayor) and Akile Cainion’s (candidate for District 6 City Council) platforms. Rest in power, Jimmie Goshey, Dejarae Thomas and Keontae Brown. Justice will be served and your names will not be in vain. thank you Iniko for telling us what is going on at Gibbs High School. I am appalled with the way they have treated you, your sister and the legacy of these three young men who were murdered by the police. I will be voting for Jesee Nevel and Akile Cainion because I want justice in this city for you and for the whole black community.